The Kennebunkport woman who attempted to help an injured, rabid raccoon that bit her and a game warden this month will not be charged with a crime, the Maine Warden Service said Monday. Lisa Gunther had the animal for only nine hours and notified the Warden Service sooner than wardens had first thought, Cpl. John MacDonald, spokesman for the Warden Service, said. Because Gunther had taken in the injured raccoon illegally, she could have faced charges for keeping a wild animal in captivity without a permit, the Warden Service said. Instead, she is being issued a warning. The animal bit Gunther and Game Warden Eric Blanchard when Blanchard went to her home to remove the raccoon. The animal tested positive for rabies, this year’s first confirmed case in Kennebunkport. Blanchard and Gunther are undergoing treatment for rabies, which involves a series of injections. MacDonald said issuing Gunther a warning was more appropriate because she had not been in possession of the animal very long. Gunther also notified wardens, but because of the time of her call, Blanchard arrived the next morning to take the animal. Blanchard, the 2017 Game Warden of the Year, was wearing a thick rabies glove similar to ones used to handle raptors with talons when the raccoon tried to bite through the thumb. 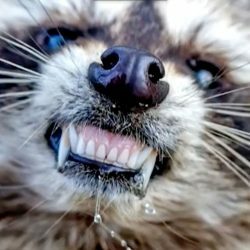 Blanchard did not believe the raccoon had broken through his skin, but was advised to go through treatment for rabies exposure as a precaution, MacDonald said. In Maine, it is illegal to keep wildlife in captivity without a proper permit, MacDonald said. Permits and licenses are issued to people who regularly come into contact with wild animals, including wildlife rehabilitators and people who relocate nuisance animals. Possessing wildlife without a permit is a Class E misdemeanor punishable with a minimum fine of $50 per day the animal was in a person’s possession.